"The Complete Guide To Raising Pet Birds For Profit, The Greatest Backyard Business Ever" is written as a practical guide for the pet lover who wishes to make an income breeding, raising and selling small pet birds. Author James McDonald made his living for 25 years with exotic birds and animals before retiring in 2000 at the age of 50. He raised tens of thousands of birds himself and built a nationwide distributorship that supplied pet shops with parakeets, cockatiels, lovebirds, finches and other small pet birds. Through the years he has helped many people start their own successful backyard business breeding these small pet birds to help supply the pet industry with the millions that are sold annually. Now, for the first time ever he has put his proven methods of success in the form of a book. The book explains how to make an excellent income, either part-time or full-time breeding the most popular species of pet birds. Many breeders using these methods make from $500 to $2000 monthly on a part-time basis while full timers make much more. You will learn how you can live anywhere and ship your birds to the nationwide market. The book is actually 6 books in one. It completely covers both cage and colony breeding methods of parakeets, cockatiels, lovebirds and finches, as well as marketing and shipping. Additionally, three chapters completely cover how to become a wholesale distributor of pet birds, which can be a very lucrative business. Although the book was written with the pet lover in mind that wishes to make an income breeding birds, there is a tremendous amount of information in the book that the hobbyist will find useful as well. Many management tips and pointers can be used by the beginner as well as the experienced person to increase yearly production, thus increasing profits. 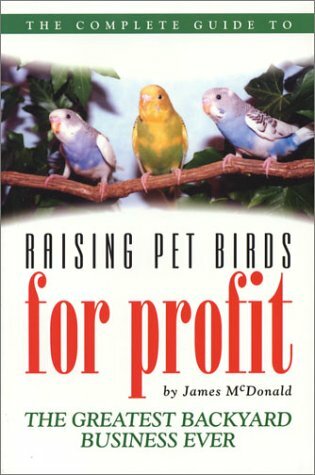 As a well known animal lover, author James McDonald sold approximately one million exotic birds before his retirement and he reminds the readers of the moral obligations and responsibilities of animal ownership and encourages the reader to always accept those responsibilities by providing humane and adequate care for their birds at all times. The book is not written in some far out technical jargon or academic terminology, but in an easy to understand style with plain and simple, down to earth language by someone who has actually "been there and done that." It is a must have book if you enjoy breeding birds and would like to make a profit while doing something that you truly enjoy. If you have any questions about this product by Brentwood House Publishing, contact us by completing and submitting the form below. If you are looking for a specif part number, please include it with your message.